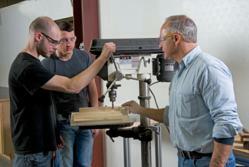 Joe Carmola, Master Carpenter instructs Halfmoon Works' apprentices. Halfmoon Works, a new nonprofit business was launched today, which provides instruction and apprenticeship programs to young adults with developmental disabilities on the art of woodworking. Students learn to craft quality wood products, which are sold to fund training and to create jobs for program participants. Halfmoon Works’ goal is to enhance its product portfolio and grow the program into a self-sustaining manufacturing business that offers many jobs to the developmentally disabled in upstate New York. The organization is located in a 3,000 square foot manufacturing facility in Halfmoon, NY, which was generously donated by a local benefactor and is well-equipped with the finest tools and machinery providing a state-of-the-art environment for learning. Students are using native soft and hard woods to create practical and decorative housewares such as cutting boards, wine bottle holders and stoppers, pens, smartphone stands, foldable Adirondack chairs, sandboxes, and raised garden planters. An online e-commerce site is now available for product purchases. For more information about Halfmoon Works programs, products and pricing, please visit http://www.halfmoonworks.com. For questions, please email: info(at)halfmoonworks(dot)com.